If you landed on this web page, you’re probably investigating the Squarespace website builder in your quest to create a website. I have a unique perspective since I have now reviewed the website two times, once in 2013 and again in 2015, And I’m sharing everything I’ve learned with you in this post. Watch my review videos from 2013 and 2015 and read my full review below. If you have any questions or if I missed something, feel free to comment at the bottom of the page. At the time I tested out Squarespace with my trial account, there were only about 25 templates to choose from. This may not seem like a lot to some people but as I describe in the video below, they do give you the ability to customize the colors for every template which gives a lot of flexibility in the look of your site. One of the reason the templates look so great in their presentation is because of the high-quality images used in the samples (see below). Back when I reviewed it in 2013, when you first load the template, the site was blank with no picture. The blank look probably freaked some people out and now they pre-populate the designs with images so they look great from the start and help users visualize the site even before adding their own pictures. Make sure you have access to high quality images, either your own photos or stock photos, because you’ll need them to create a great site with Squarespace. Squarespace has a certain look to it. Clean lines, flat design, black/white/gray color, and large images. If you don’t like this look, you may want to look at a different website builder. You can change the look of a Squarespace website, but you’ll be fighting an uphill battle because this modern look is ingrained into everything Squarespace does. Since I mentioned the Squarespace aesthetic and the ability to customize it or NOT, let me show you what they allow in terms of customizing the look. Style Editor – People wanting to add their own color will love fiddling with the style editor. 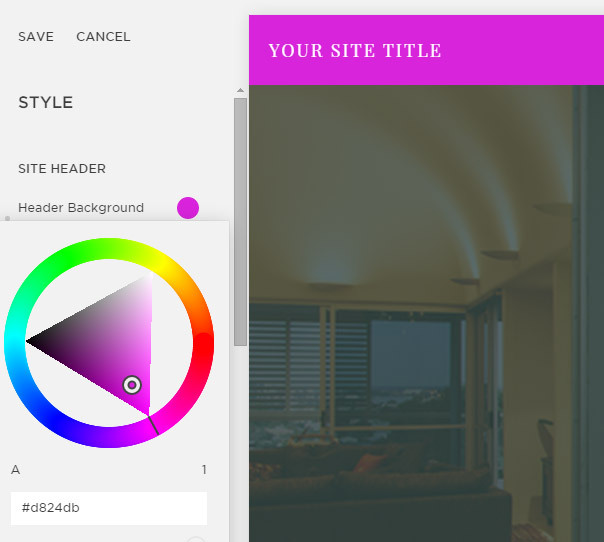 The Squarespace website builder gives you the ability to change the color of almost every element on your site. Proceed with caution though and remember – less is more! 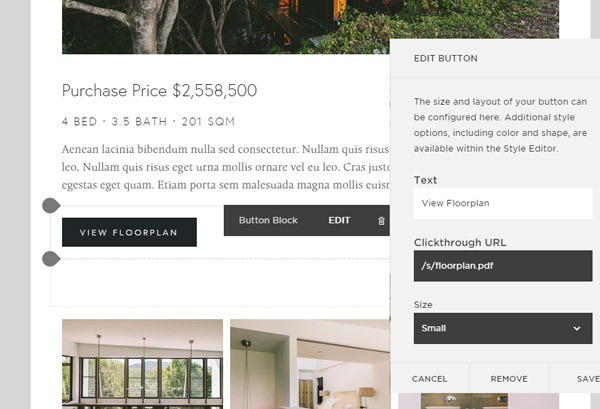 Template Switching – Squarespace allows you to switch between templates unlike many other website builders. This is a handy function since it’ll allow you to update the site with a new look or switch to a newly released design template in the future without losing all your work. You’ll probably need to tweak some things, but you won’t have to start from scratch. 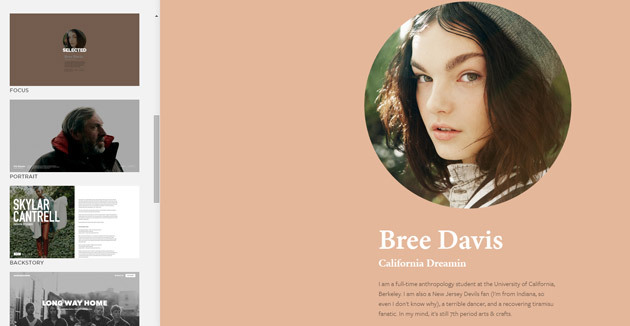 Not Your Typical Typography – If you’re a font perfectionist and love to fiddle with fonts until you get the size, color, line height, kerning that gives you goosebumps, then you’ll love the font options provided by Squarespace. They’ve put in the work to provide you with template defaults that are attractive and modern, but they also allow you to adjust everything and choose from a ton of web fonts installed and ready to go. 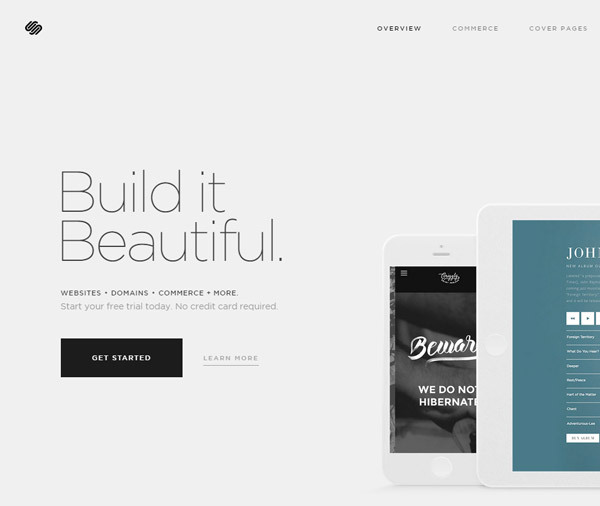 Squarespace Website Builder – Fun or Frustrating? 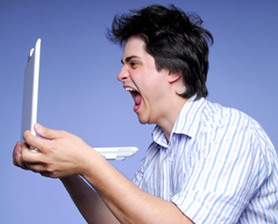 When I test out website builders, I like to measure them on a level of Fun to Frustrating. It becomes fun to me when I can easily and intuitively use the website builder and create an awesome website fast, when it becomes an artistic experience and not a exasperating endeavor. I have to admit that in the first 30 minutes of using the Squarespace website builder, it can be a bit frustrating even for someone like me who is a web designer and has tinkered with website builders for years. Don’t worry, the fun certainly comes into view. It’s just up ahead over the top of that learning curve. Plan on it taking some time to figure out how everything works. Beginners can definitely pick up Squarespace and use it immediately, but the user interface almost assumes that the user is a designer or has some intermediate experience in web design or at least some above average computer skills. For example, the style editor has terms like padding, margin, line-height that many beginners may not know right off the bat. And the process of dragging and dropping content blocks, which is foundational to the build process, took me a few minutes to figure out. This assumption of aptitude makes the interface more powerful for seasoned Squarespace users, but I can see learning curve period being taxing on new customers who just wants to get a site online fast. I’m not even saying Squarespace needs to make these things more simplistic. That might actually decrease the power of the website builder. I’m just letting people know who Squarespace is really designed for in my opinion. For people wanting to find the website builder that is easiest to use or if you’re a little scare of the technical aspects of using a website builder, you may want to check out the Weebly website builder instead. In reality, if you dedicate an hour or two to conquering the learning curve and following some of the startup documentation provided by Squarespace, you should find yourself on the other side of the learning curve and having fun as you cruise towards the completion of your site. Squarespace Pricing – How Does It Compare? One of the first aspects of Squarespace that caught my attention back in 2013 was the low price of the Squarespace Business package which allows you to sell products for only $24/month + processing fees. That is very competitive and the Commerce interface is powerful and easy to setup. It may not be as full-featured as a dedicated e-commerce platform like Shopify or Volusion, but it comes pretty darn close. For those who don’t need e-commerce capabilities, the Basic package at $8/month is their cheapest option but it limits you to 20 pages. This should be more than enough for people looking to create a simple website. For $16/month, you can upgrade to their unlimited package which gives you unlimited storage and pages. This is still a good value when you consider the costs of hosting and the quality of design that you are getting with the Squarespace templates. Overall, the Squarespace pricing is fair and provides a great value in my opinion, The pricing has remained the same from 2013 to 2015 and I can’t say I’ve seen that type of price consistency with other website builders. Squarespace Errors… Gone for Good? This section was written in 2013, and I’ll include it here for total transparency. I believe Squarespace has fixed these types of problems because I did not experience them this time around. If you have any errors like these errors I experienced in my 2013 review, comment below. Disappearing page – This one is shown in my video above. I spent several minutes creating a page, clicked Save & Publish, and when I went to preview the site, the page was blank and the content I had created was not there. So I went back to the content editor and clicked Save & Publish again. When the page was reloaded, it was blank and all my content was gone with no way to recover it. This was interesting to me but to people really building their website, it can be extremely frustrating. Luckily, I had another copy of the page saved, but there’s really no way to prevent this from happening for the average user. You expect the page to be saved & published when you click Save & Publish. If it doesn’t happen, you’re pretty much screwed. Lagging – This one very well could have been my browser but it is not something I normally experience so I suspect it was a hangup in the Squarespace builder. When I clicked the ‘browse for image’ button on the image element, it did not open a dialog box. So I clicked it a few more times. After clicking it 10 times, it opened 10 dialog boxes which took about 2 minutes and slowed me down big time. This was just an annoying little thing but a few of these annoying things can add up to a poor overall experience. Wrong Page Content – This problem is similar to the disappearing page but instead of page content disappearing, it would be copied to all other pages. For example, if I just saved the About page and then clicked on the Home page to begin editing it, all the About page content I had just created showed up on the Home page too. I tried clicking on another page and it was also showing the About page content…Weird. I had to logout and log back in to get the pages to show correctly. I didn’t lose anything but it was pretty annoying and I can see how it can easily lead to a lost page. These errors, although I don’t know if they are consistent across browsers and other users, were pretty debilitating to my overall experience and would lead me to seriously question using the website builder over the long term. If I was considering using Squarespace, I would first email support and ask them to address these concerns. If you’ve used the Squarespace website builder, have you experienced glitches like this? Cover Pages – Cover pages are definitely a new addition since my 2013 review and offer customers the ability to give unique design and functionality to intro pages, or create a beautiful and simplistic one-page website. Check them out here. 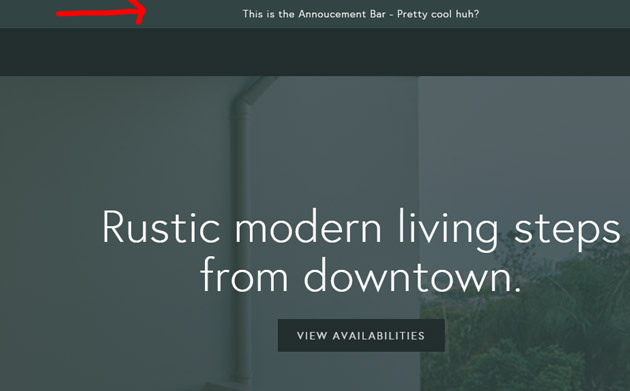 Announcement Bar – This seems like such a small thing. It literally is small! It’s just a thin bar at the top of your website where you can add announcements. But I’ve never seen a website builder that has this function, and even doing this on a WordPress site would require installing a plugin or manually creating it. If you have a sale or an important update for your visitors, just go type it in your Announcement Bar, add a link, and BAM!…announcement made. Mobile Info Footer – Squarespace gets mobile and the templates are mobile friendly, but they also get that some info is more important on mobile, and they provide a mobile info block in the footer to provide critical contact info on phones only. Smart & simple. Charts – Unexpected to say the least, and not something I’ve yet seen from even the more popular website builders, Squarespace allows you to drop charts into your site using a few different chart blocks. I didn’t play around with these much, but I’m confident they’ll be up to the standards of the Squarespace look they exhibit everywhere else. Logo Designer – Another unique innovation I have not seen elsewhere that shows Squarespaces dedication to aesthetic and design. The logo design is a simple to use web application that allows anyone to create a simple logo using great typography and sharp icons. You can then drop the design right into your site and Squarespace members can even download high-resolution files to use for printing. Food Menu Block – This might not be usable to a anyone but restaurants, but Squarespace is probably watching their customer data and knows they have a lot of customers who are restaurants. These customers will love that they can drop in a menu content block to quickly customize their food menu. A nice addition considering food menus can be become quite a task in formatting, alignment, etc. Now that I’ve been reviewing website builders for a few years, I have a unique vantage point of being able to watch website builders over time and see how they change or stay the same for better or worse. 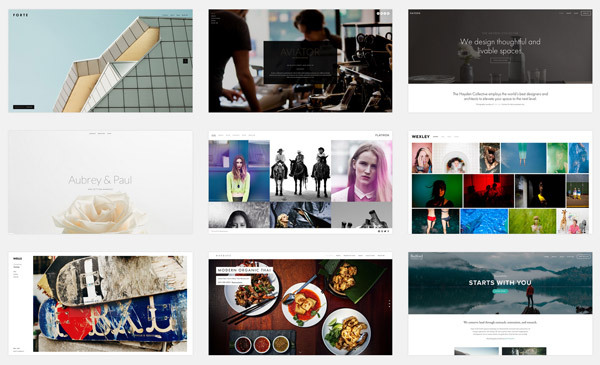 I liked Squarespace in 2013 when I first reviewed it, but it has gotten much better since then. 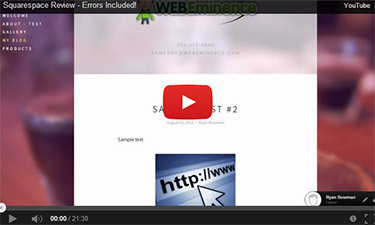 The errors I experienced on which you can see in my review video from 2013 above should be a deal breaker for many people and would be for me if I was investigating a website builder. You can’t have unstable software where people will lose their work. But I believe (and hope) Squarespace has fixed those problems because they were non-existent as I reviewed it in 2015. It’s obvious that Squarespace continues to innovate in the website builder field. There were many obvious improvements and addition in terms of the focus on mobile and the variety of widgets (they call them content blocks) that they offer which are the foundation for building your website. Squarespace has exploded in popularity thanks to a few SuperBowl commercials over the last few years and the fact that they just have a solid product. Since I first did my review in 2013, Squarespace has also removed their affiliate program where people like me can earn money when people purchase their service through my link. That’s how I and many other website builder reviewers earn income from these reviews. There are many reasons a company may not offer affiliate commissions, but my guess is that they instead focused marketing dollars on massive marketing endeavors like the SuperBowl commercials. Since Squarespace doesn’t offer affiliate commissions, many review sites may choose not to cover them. I still choose to recommend and review Squarespace. It would be shortsighted to not review one of the best website builders currently offered.